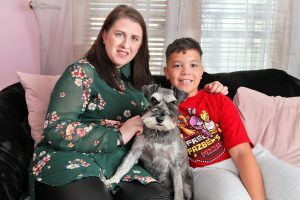 A COURAGEOUS Newbridge mother has been chosen to represent Ireland at a European Relay for Life conference in Amsterdam this month. 34-year-old Amy Mahon is a cancer survivor and has been Survivor’s Chair at Relay Kildare for the past two years. Earlier this year she was named Irish Global Hero of Hope for her inspirational battle against thyroid cancer. Amy was 29 when she was diagnosed with the illness and was busy planning her four-year-old son’s birthday party. Amy had had the lump in her throat looked at in 2010 but never got it biopsed. It was only two years later, when a friend questioned it, that she had it checked out again. “I had put my make up on over it for two years. I just got wrapped up with everyday life and didn’t think about it,” she said. Within a week she had surgery to have her thyroid completely removed. The cancer had spread to her lymph nodes and they were also removed. She said her son Danton, now 11, found it difficult to deal with the illness, particularly as she had to remain in isolation for five consecutive days. “It was Christmas morning really before he could give me a hug. “I looked like the bride of Frankenstein. My scar started half way across my neck and went behind my ear and all the way down to my shoulder. Keen to shelter her him from the realities of cancer, Amy explained that she had to go to hospital and that his grandparents would take care of him. Amy is now very invested in Kildare Relay and enjoys organising the pampering sessions for the survivors. “People ask me would I not like to be pampered but I get more enjoyment out of organising it for everyone else. “They are different reasons that took us all to Relay but we are all there for the same reason. We have all experienced cancer in some way and want a future where we never see cancer again,” she said. Amy said dealing with cancer is tough but she urged people going down this road to lean on those around them. “Speak to people, tell them how you really feel and take time out for you,” she said. She recommended getting in touch with the Irish Cancer Society helpline 1800 200 700 and ask to be put in touch with someone who underwent a similar road. “Not everyone likes to talk but for me personally it helps,” she said. Amy’s son Danton was one of the volunteers this year and had plans to stay at the event for the full 24 hours but mother nature called a halt to the event in the early hours when the wind became too strong. “Mother nature took over, I’m not friends with her on facebook any more,” laughed Amy. She will travel to Amsterdam from 18-20 October and give a presentation on Ireland’s Relay for Life events. “It will be great to get some information and tips from other countries on how they do their Relays,” she added.